Earlier in the evening, a longhaired dachshund and Havanese took their groups. They haven't been chosen as America's top dog, either. The Havanese is the national dog of Cuba. The breed has never won best in show at America's top pooch pageant, and Bono will get that chance Tuesday night at Madison Square Garden. "Whoever brings it home, it's team," she said. This is the 143rd edition of America's top dog competition, and no dachshund has ever walked off with best in show. "Dachshunds are the best breed in the world," Puig told fans at Madison Square Garden. 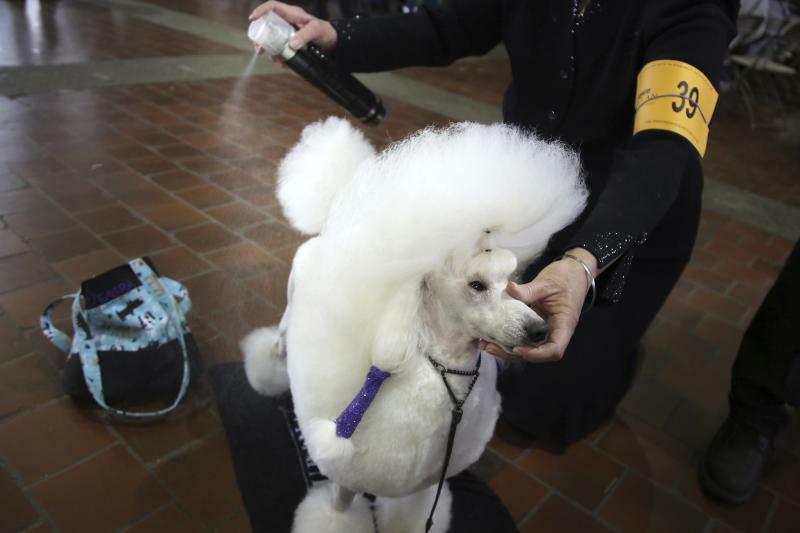 You might say the Westminster Kennel Club dog show's obedience competition is Heart to win. Brennan's was inspired by "The Red Balloon," the 1956 French movie about a boy who's followed around by a red helium balloon. In the obedience competition, Heart picked up and carried a similar balloon while doing jumps and other exercises. Brennan is an obedience trainer from Columbia, New Jersey. She says 6 ½-year-old Heart loves the crowd and the buzz at the big Westminster show and "just turns on in this environment." Whiskey had won the big National Dog Show televised on Thanksgiving Day and the AKC event shown on New Year's Day. But his bid for a Triple Crown of dogdom ended when he was topped by littermate Bourbon in the breed judging this afternoon. "He's got the 'it' factor," said owner Carolyn Koch of Chapel Hill, North Carolina. "He's everything a pug should be. He's a lap dog. He's a comedian. He's a family dog," she said. "And he loves to show." Instead of taking an early victory lap, Biggie took a victory nap. He spent part of the afternoon sleeping in his crate — on tap there was a plastic bag that had the words "Life is Ridiculously Awesome." In the world of dog shows, there's no shame in sleeping on the competition. At least not for GCH Haystac's Montgomery The Spartan General — or Monty, for short. The Old English Sheepdog is named after British Field Marshall Bernard Montgomery, who fought in World War I and II. Monty isn't much of a fighter, but he hasn't had to be. In fact, he may fall asleep before you can finish saying his name. Monty took a preshow snooze on the groomer's table at a recent competition in Canada, slumbering away while handler Virginia Goscinak brushed out his puffy white coat. Goscinak woke up the 3-year-old dog shortly before the competition, and Monty went into the ring and came out a best of breed winner. A few hours before competing at Westminster, Monty was back in top form, lazing away while two groomers brushed and sprayed his fur. Goscinak had to pull back the tufts on Monty's face to confirm his eyes were still open. "He loves this," Goscinak said.